Shaphee Lanphee is a rare traditional handicraft of Manipur embroidered with meaningful motifs. It has its own historical significance that it was used as Mana Phee (Reward) by the kings of Manipur as a token of honour to his brave soldiers, coming back home victorious after a battle. As times changed, such rare work of art is slowly losing its place due to lack of people’s awareness about this particular handicraft’s association with our cultural and historical values. But Maisnam Nalini Devi, a weaver from Wangkhei Yonglan Leirak venturesd into the profession of creating Shaphee Lanphee. Embracing the art learnt from her mother, Nalini has been working to promote the Shaphee Lanphee craft with dedication for years. To preserve the languishing craft, she is providing training to some local women trainees who would carry on the craft in generations to come. Born on March 1 1958, Maisnam Nalini Devi is the daughter of late Maisnam Ibohal and Keinahanbi Devi. Her fathere died while she was a child. Her widow mother managed to maintain the family and sent her children to school with her meager earning from weaving. Her mother, Keinahanbi, who won state award in 1992 for promoting the handicraft Shaphi Lanphee, could manage the family expenses with the income gained from embroidering Saphee Lanphee. Nalini and her late younger sister Anita, followed the footsteps of their mother and learnt the skill of weaving and embroidering of Shaphee Lanphee from their late mother. Her sister Maisnam Anita too received the state award in 1992 for making Shaphee Lanphee. Unfortunately her sister Anita passed away and now she is the only artisan who has been carrying on the family legacy in Shaphee Lanphee craft. Like her late mother and sister, Nalini too won state award for Mastercrafts person in 2009 in recognition of her excellent work in the craft. 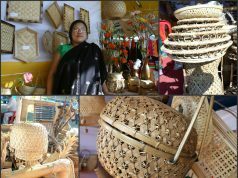 Panthoibi Cultural Research Centre for Performing Arts, Imphal honoured her by conferring the Nongpok Panthoibi Award, 2011 in recognition of her relentless effort towards promoting the rare traditional handicraft Shaphee Lanphee. She got third position in the best stall in product innovative and best display category in the second Eco Craft bazaar organized by Creations Society for Handicrafts and Goodwill held from 15th to 24th March 2007 at Mapal Kangjeibung, second position in the state level handloom and handicraft competition, 2007 organised by Ima Manipur handloom and handicraft Development Association, best stall award in second Basanta Craft Bazar competition, 2008. She has donated a fine masterpiece Shaphee Lanphee shawl made by her to the Shilheipung Craft Museum for proper preservation and display of the languishing craft. Handloom industry of the family, no doubt, boomed during their peak time. But after the demise of Anita, her mother Maisnam Keinahal had to carry on single handedly with some support from Nalini. Then after the demise of Keinahal, Nalini carried on the legacy of this craft. 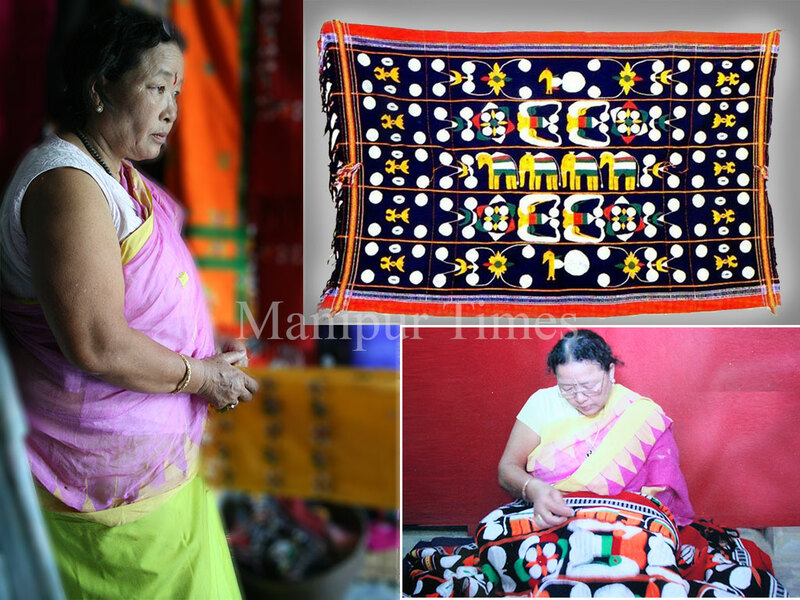 She showcased the rare Manipuri handicraft Shaphi Lanphi in many state and national handloom exhibitions. Nalini got married with Ningombam Romi Singh of Singjamei and has a daughter. She faced many challenges including the untimely demise of her husband, and raised her only daughter alone. After the death of her husband, she came back to her maternal house along with her daughter, adopted the craft to carry on the family legacy in Saphee Lanphee. Under her guidance, about 15 women trainees are learning the art of Saphee Lanphee craft. 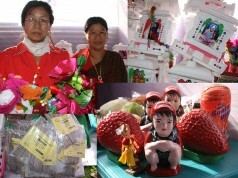 The handloom products made with the support from the women workers are sold out to market. A worker can earn Rs. 300 for complete embroidering a Shaphee Lanphee. 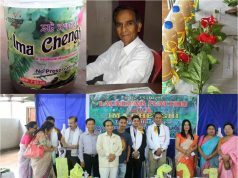 For her, the craft has been a thriving business with the demand of the product increasing gradually that, even without her husband, she is able to maintain the expenses of her daughter who is undergoing MBBS course to some extent. This traditional handloom product is beautifully designed with different meaningful motifs embroidered. Motifs such as the sun, stars, fish, spear, peacock, Pphantup, iroimachi (Buffalo horn), horse, elephant. 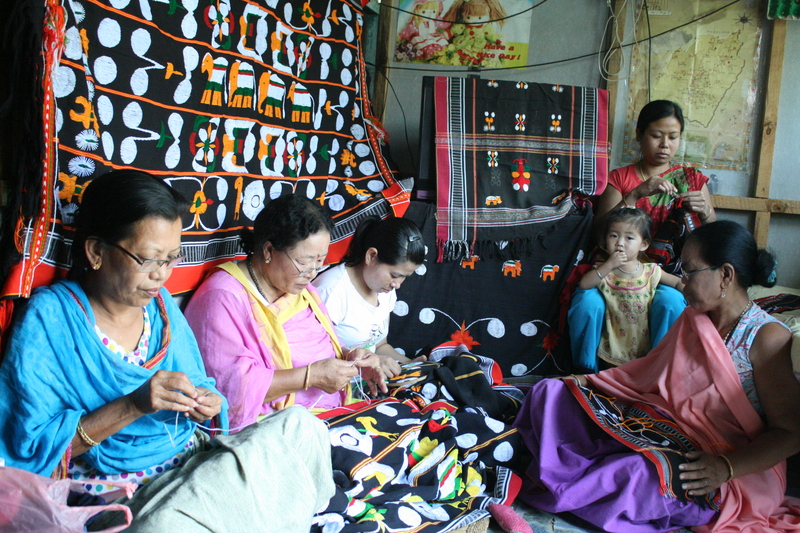 Since years, tribes inhabiting in Manipur and Nagaland with high regard have used the craft Shanphee Lanphee usually woven by Meetei women. The craft comprising different meaningful motifs is woven either on loom or waistloom and then embroidered with motifs. This traditional handicraft has great demand in the international market as decorative item. 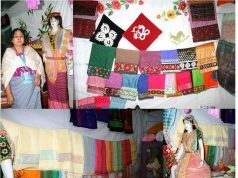 Production of other handicraft items in the form of Bed cover, Shawl, Waist coat, Scarf, Bag and Curtail etc. with simplified Shaphee Lanphee motifs has made the craft more popular and much liked item in the international market. 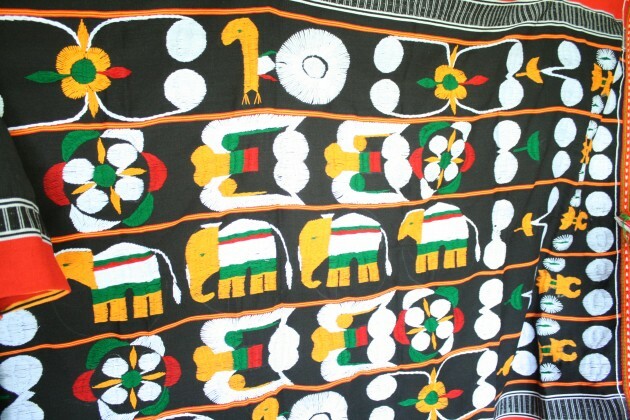 It is believed that this particular craft embroidered with complete motifs protects a house from the evils and those who embrace this belief come to my house for purchasing the cloth. 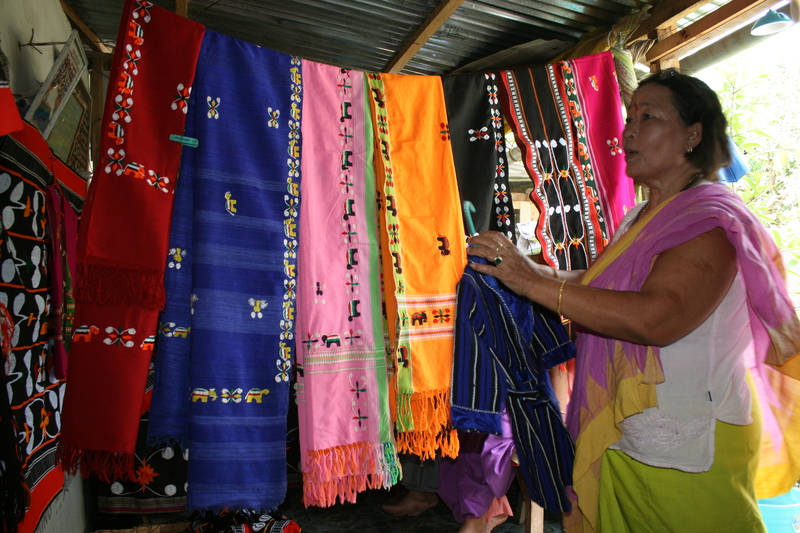 A Shaphee Lanphi cloth with complete embroidered motifs is not used as Phanek (usually worn by Meetei women) or bed sheets as it is believed to have godly power. 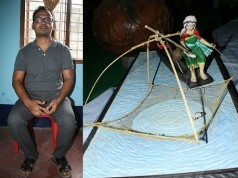 Tribal people use it during burial ceremony of a death man or wedding, said Nalini. Loiyumba Sinyen puya which recorded the division of professions to every Meetei Shagei (surname) during the reign of king Medingu Loiyumba (1074-1122), weaving of Shafi Lanphee was provided to Khoisnam surname. Womenfolk of Khoisnam were found weaving the craft up to Second World War. With many women of Khoisnam marrying to another surnames, weaving of the craft spread far and wide. 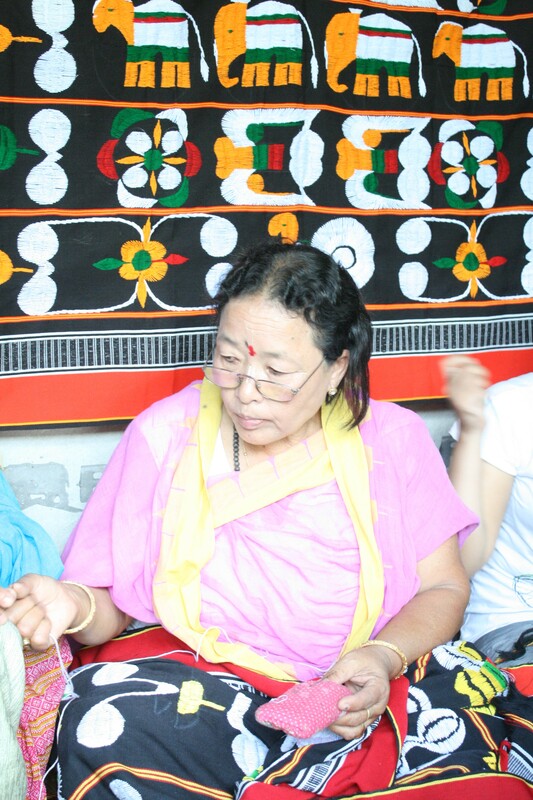 Among them, Soubam Ningol Chaoba Devi who married to Phandom Shagei of Thangmeiband was also one who used to weave the cloth. The art learnt from her mother Khoisnam Ningol Chaobiyaima was passed to her daughter Maisnam Keinahal. Keinahal then taught the art to her daughter Nalini. 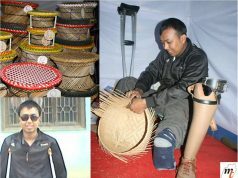 Recently, Shaphi Lanphi handicraft of Manipur has got a registration under Geographical Indication (GI Registration) under application number 371, making the Manipuris feel proud of it. 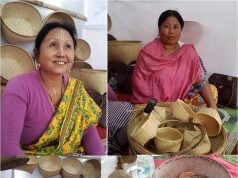 Two popular Manipuri handicrafts, Wangkhei Phee and Morang Pheejin too were registered under GI registration under application no. 372 and 373 respectively. Geographical Indications of Goods are defined as that aspect of industrial property which refers to the geographical indication referring to a country or to a place situated therein as being the country or place of origin of that product. Typically, such a name conveys an assurance of quality and distinctiveness which is essentially attributable to the fact of its origin in that defined geographical locality, region or country. May be the naga tribes were awarded by king,and they preserved it. Naresh Leimapokpam we need to have a debate over this. With a bottle of Rc. Nice art.!!!!! !this is copycatted shawl of naga!!!! Good… Promote it. 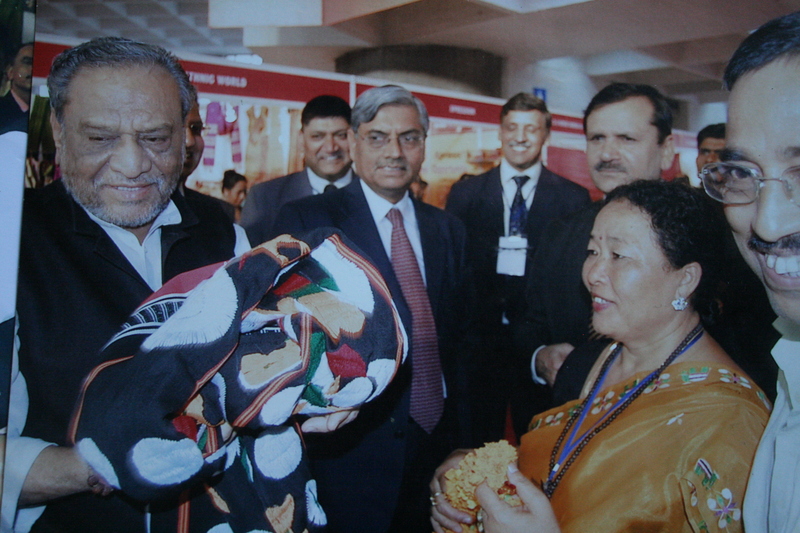 U will see this shawl in all the naga tribes.